Montana's 2005 growing season in southwestern Silver Bow County was 76 days. The state's gardeners, depending on their locations, coped with a 2005 rainfall of between 9 and 25 inches. The West Yellowstone area makes regular appearances on the U.S. Lowest Daily Temperature list. A few hardy flowering trees, however, have managed to overcome the odds against survival in the Treasure State. Montana gardeners can depend on them for reliable performance. A small tree reaching only 12 feet high, redosier dogwood (Cornus sericea) is especially noticeable in winter for its red branches. During June, the trees have flat clusters of fragrant, creamy white, up to 2.5-inch flowers attractive to butterflies. White berries follow the flowers. Purple fall foliage provides more appeal. Redosier dogwood grows wild along Montana's riverbanks and other wet areas. Tolerant of temperatures as low as minus 45 degrees F, it's hardy throughout Montana. Plant it in alkaline to slightly acidic, moist, well-drained loamy soil and sun to part shade. Trees suffer from a range of pests and diseases including bagworms and twig blight. Birds, mammals and deer feed on the fruit, and several wildlife species shelter in redosier thickets. Smoketree (Cotinus obovatus) is hardy in Montana's USDA Hardiness Zone 5 areas, most of which are in the central and upper northwest part of the state. Native to Europe and China, it’s a member of the sumac family that grows up to 15 feet high and wide. 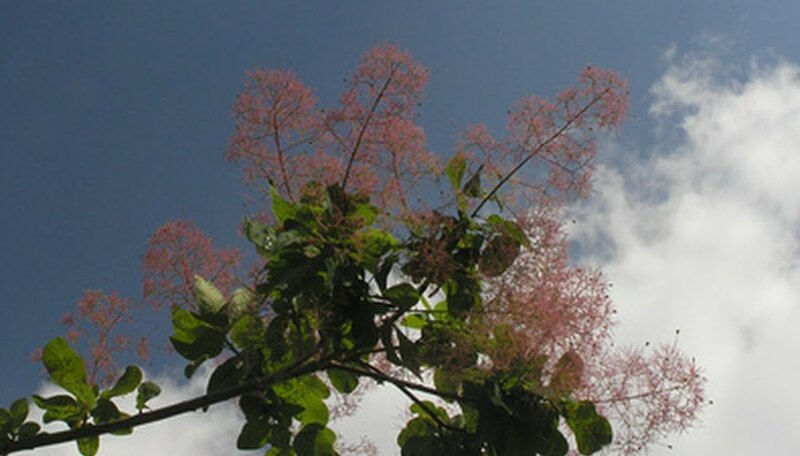 Upstaging smoketree's May and June clusters of small yellow flowers are clouds of pink to purple hairs the spent blooms sprout later in the summer. Their hazy effect accounts for the tree's name. Adapting easily to most soils, smoketree objects only to wet, poorly drained locations. It's happiest in full sun and loam but can handle even infertile rocky locations. Purple-leaved cultivars of smoke tree, says the Lady Bird Johnson Wildflower Center, are especially attractive landscape plants. All varieties are capable of brilliant yellow, scarlet and purple autumn foliage displays. Oleaster (Elaeagnaceae angustifolia) is a 12- to 20-foot high and wide tree native to Europe and central Asia. It's hardy throughout Montana except for a tiny Zone 2 area in northwestern Beaverhead County. Oleaster has striking silvery-gray foliage accompanied in May and June by equally unusual, fragrant silvery flowers with golden-yellow throats. Silver olive-like fruit follows the flowers. The fruit feeds wildlife and makes tasty preserves. Peeling brown bark is an attractive winter feature. Oleaster, says the Missouri Botanical Garden, is a rapid grower tolerant of a wide range of conditions. It accepts wet and dry soils--including heavy clay--high salinity, summer heat and strong winds. Trees do best, however, in full sun and well-drained, sandy loam soil. They suffer in high humidity. When Does the Pollen Stop Falling?